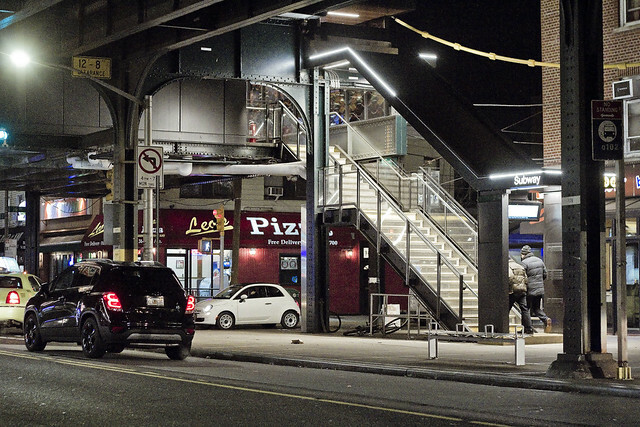 Pictured above is the newly reopened Broadway stop on the Astoria line N/W elevated. I spent all week describing a walk heading northwards along 31st street towards Astoria Blvd., so I decided to do one today describing the walk southwards from Broadway towards Northern Blvd., just in the name of completeness. 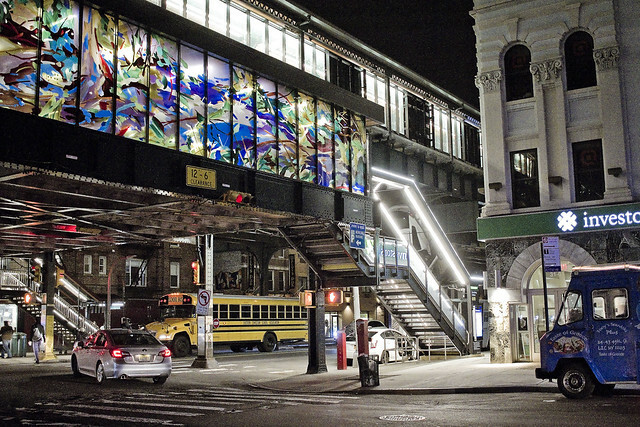 The station has been rebuilt and reimagined, as one of the new “Enhanced Stations,” by Governor Cuomo, who does and does not run the MTA with an iron fist. It’s the Dark Prince of Albany who decides on when and if he’s in charge, so ask him if today is one of those days. The enhanced stations bring some amenities to the table like station wifi and new security cameras, and Broadway in particular has seen a new exit only stair way (no fare control) installed which really has been a game changer in terms of expediting exiting of the facility. The big change, most noticeable from the street, has been the amount of new lighting systems installed, which has really altered the “feel” of the corner. 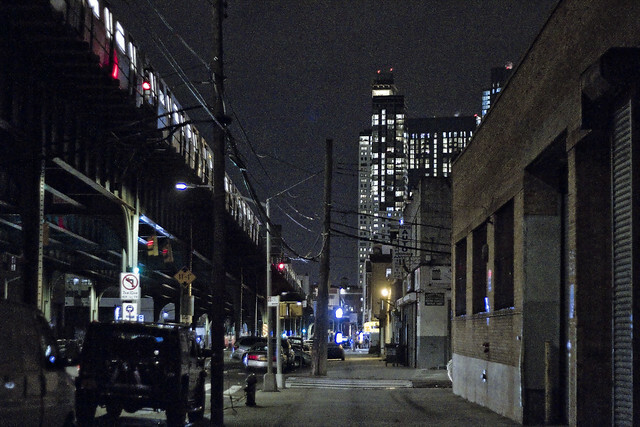 Most of the 31st street corridor lives in perennial and centuried shadow, and even during the day, it’s dark. The street lamps are generally miniatures, with smaller than normal luminaire heads sitting on midget sized poles directly over the parking lane except at the intersections. 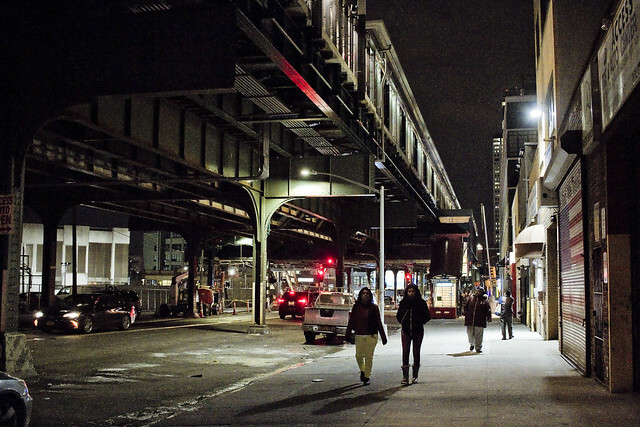 There’s no lighting system in the middle of the street, suspended from the trackage, which lends an ominous “noir” to 31st street. Personally speaking, given my proclivity towards darkness and skillful street camouflage born of living in 1980’s NYC, such lack of ambience holds no terror. Were I a lady or looked like I had money in my pockets, however, I’d likely be clutching my pearls while walking down this street given the lack of street life and darkness. The lighting schemes of the new stations spurt ambience all over the place. That’s the 36th avenue stop in the shot above, if you’re curious. It’s one of the “angles between neighborhoods” spots here in Western Queens, with LIC’s Dutch Kills and Ravenswood neighborhoods found to the south and west of 31st street and the “Astoria/Not Astoria” triangular shaped neighborhood between 34th avenue and Northern Blvd. to the east and slightly north. It’s also one of those interesting spots in Queens where you’ve got a soft geographic boundary between two wildly different ethnic populations, mostly Pakistani and extremely religious Muslims to the west and Brazilians to the east. There’s lots of other people mixed in there, of course, but dominant population groupings are what makes a neighborhood distinctive. The remnants of “mixed use” industrial zoning can be observed on the dark parts of 31st street as you proceed south, but these buildings and businesses are doomed by the aspirations of the affordable housing crowd and the Real Estate Industrial Complex. It’s already started, there’s more than a few of these old warehouse and factory buildings which have been demolished to make way for cookie cutter glass box residential buildings. In the distance, you can see the high rise residential buildings of Queens Plaza and “next big thing LIC” rising alongside the boundaries of the Sunnyside Yards. Nearing 39th avenue, where another of the enhanced stations is nearing completion, and the luminance of said station making a real difference in the “feel” of the street. Across the street from where this shot was taken is a Coptic Christian church and pastorate house which serves a mostly Egyptian community, or so I’m told. A large group of apparnetly Egyptian men were gathered in front of a new Dunkin Donuts on the corner of 39th, drinking take away coffee in paper cups and smoking cigarettes while debating something in their native tongue. It was growing colder by the minute, and I decided it was time to start winding up my “constitutional” and head back home to Broadway in the 40’s via Northern Blvd. Progress? One still wonders about the lack of street life, storefront businesses, and ambient light on 31st street. 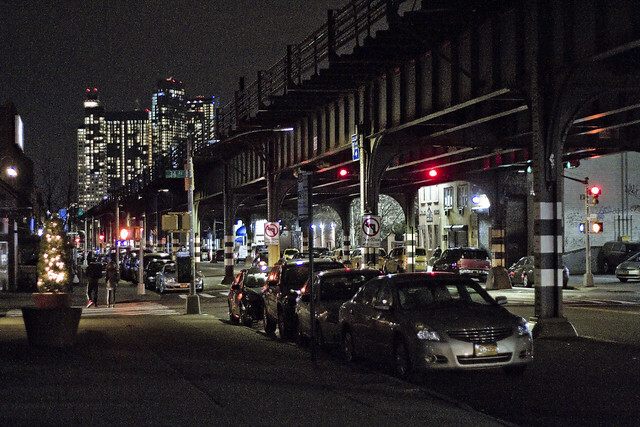 It’s a traffic thoroughfare ultimately – 31st street – connecting Queens Plaza with the Grand Central Parkway and Triborough Bridge in its 20th century incarnation. There are, in fact, homes and businesses along its route, but personally I wouldn’t want to live along it. 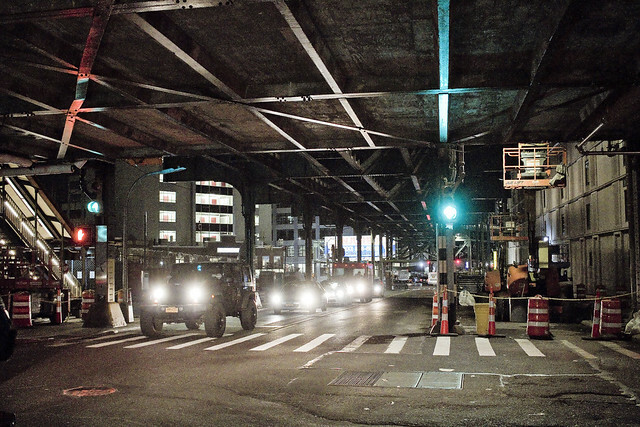 One thing I haven’t mentioned, whether in this series of posts or the ones from a couple of weeks ago describing Roosevelt Avenue and the streets of the Flushing Line corridor, is noise. Train noise, specifically. Famously, I’m always listening to something on my headphones while out on my little jaunts, and when the train is passing overhead the noise overwhelms the speakers which are plugged directly into my ears. Can’t imagine what it’s like living next to those tracks, it must be hellacious.